In honor of our new location: Peippo at Covenstead, here is a release made with the spiritual nature of the community of Covenstead in mind. Beaivi dress comes with a bolero, shoes and long underpants, and is butter yellow due to the myth of the sun goddess. People would eat butter and use it for rituals that were meant to convince the sun to approach quicker. Sami people live in the north, where winters are long and very dark. 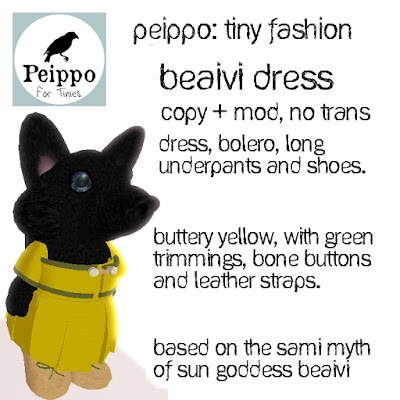 Beaivi was a goddess of mental healing, and rebirth of nature. She sometimes appeared with her daughter, who had reindeer antlers. A white female reindeer was also offered to her during spring time. The dress is available in all our locations for 60 lindens (apart from our texture store).